Doug Tallamy, author of Bringing Nature Home and professor of entomology at University of Delaware, spoke in York last night. The place was filled to capacity, and he was warmly received. He presented some amazing facts and figures about plants, trees, birds and insects. He quoted numbers that I did not write down...but are staggering...of how many acres are in national park, how many paved and how many are in yards. And agriculture too. As a bug guy, he wants bugs to have a chance. Through a whole run of slides of caterpillars he named one after another, each crazier looking than the rest. And producing crazy looking moths and butterflies. It turns out that our song birds need massive amounts of caterpillars to raise their young. For a couple of weeks from spring to early summer, many varieties of songbirds are hatching out their babies, who eat caterpillars in staggering numbers. On his own property he observed a pair of birds feed their young from sun up until sun down a caterpillar every 3 minutes or so. All day long! His calculations put the number of caterpillars needed into staggering amounts to get each baby bird to where they can fly. 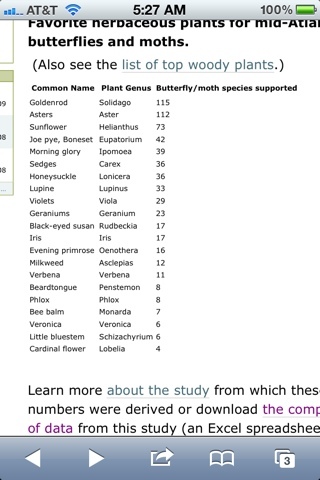 We have many of the flowers on this list growing on our property. We will add more. His website also lists trees that support massive amounts of birds in their search for caterpillars. We will add more of those too. Every time we see another bird on the farm we are tickled. This year we had red winged blackbirds all over for a few weeks. Homer saw an oriole the other day, we see gold finches, chickadees and cardinals on a regular basis. While neither of us can identify very many song birds, they do make us stop and look at them, as they are beautiful. This chemical free farming, rotational grazing, messy property that we have grows bugs. No question. Any as we observe the birds all over we see them pulling caterpillars and other larval bug stages from all over the farm. As I pick peas the birds are flying all around me. Dr. Tallamy tells us that what the birds are looking for and eating, in massive amounts, are all those baby insects that damage what we grow. That the birds will eat seeds and berries but the first interest is in that larval bug stage, just what we want to get rid of. Lovely. We will get seeds for more flowers, and next spring, when our county has the annual tree sale, we will be certain to add a few trees, whips they are called because they are so small...Dr. Tallamy advised us to think of them as oak shrubs, so that we can enjoy them in our lifetime rather than thinking that trees are only for the future! We can enjoy a small tree too! I've read his book and will read it again. He has a different perspective on landscaping than we do...he is neater than we are. It seems the bugs, and the birds, don't really mind.